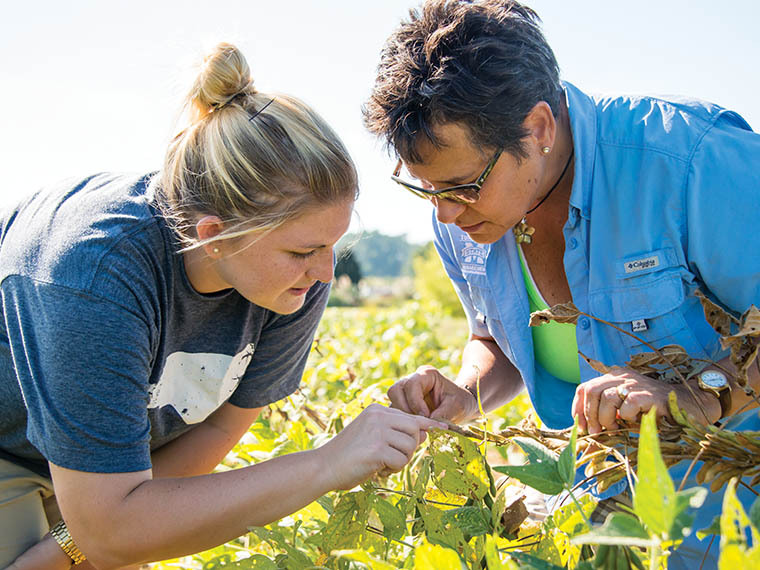 Graduate student Nicole Brochard and Maria Tomaso-Peterson, research professor and plant pathologist in Biochemistry, Molecular Biology, Entomology and Plant Pathology examine soybeans at the R.R. Foil Plant Science Research Center. Photo by David Ammon. Foliar soybean diseases can result in significant yield loss in soybeans making chemical control practices necessary. The strobilurin or quinone outside inhibitor (QoI) class of fungicides are primarily applied for late-season disease management in soybeans as well as providing a minor yield benefit when applied at the appropriate growth stage (R3/R4). The two most commonly used fungicides are azoxystrobin (Quadris) and pyraclostrobin. However, as is the case with many fungi, Cercospora sojina, the fungus that causes frogeye leaf spot, is developing resistance to strobilurin. The fungal population progressively shifts to resistance, allowing the resistant spores to increase in numbers throughout a soybean field. This is called practical resistance. Fungi have a higher likelihood of becoming resistant to strobilurin fungicides because this class of chemicals has what is known as a “single-site mode of action,” which means it has only one way of attacking disease-causing organisms. Strobilurin fungicides target fungal respiration. Research professor and plant pathologist Maria Tomaso-Peterson is investigating strobilurin fungicide resistance of soybean pathogens in Mississippi. In 2012, soybean fields in two Mississippi counties were found to have isolates of the frogeye leaf spot pathogen resistant to strobilurins, the class of fungicides commonly used for late-season disease management in soybeans. Tomaso-Peterson and graduate students under her direction conducted a statewide survey in 2013 and 2014 to determine the extent of QoI resistance among Cercospora sojina in Mississippi soybean production. Results of the survey included 686 soybean samples with symptoms of frogeye leaf spot collected in 78 soybean-producing counties throughout Mississippi. From the samples, Tomaso-Peterson’s group isolated 634 Cercospora sojina isolates of which 593 were resistant to QoI fungicides based on amino acid substitutions at the QoI target site in respiration. In trials conducted during the 2013 soybean season, fungicides with an ability to treat the disease—notably the triazole class of fungicides—were more effective at reducing yield loss when applied in the presence of frogeye. The continued monitoring for the presence of strobilurin resistance in frogeye leaf spot will provide soybean producers with valuable information to help them manage the disease and reduce the likelihood of yield loss or crop failure. For Tomaso-Peterson, the purpose of her research is to help educate Mississippi soybean growers in terms of fungicide resistance management. Frogeye leaf spot-resistant soybean varieties should be considered as a tool in managing fungicide resistance along with crop rotation, applying fungicides at the label rate, and alternating fungicide classes for frogeye leaf spot control.